Blurb : They lurk in the Ralferst Forest, striking out at all who pass through, robbing traders, assulting farmers, even killing with impunity. Working from a secret base deep in the forest, a band of thieves has struck fear into the heart of Brandon's Bridge, the little village at the crossing of the Azure River. 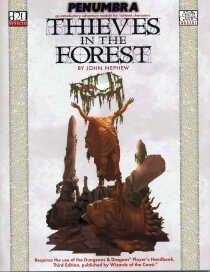 But now a band of heroes has come, seeking glory and adventure - heroes that might just be up to the challenge of driving away the Thieves in the Forest. The Module : The second D20 system module from Atlas Games, this improves on an already good format. As with the first module this is well laid out with great art, (I really like the "ruined column" sidebar's!). the maps are created on Campaign Cartographer 2 and look a little out of place next to the artwork. However a huge advantage in having the maps in CC2 means that they are available from the Atlas WWW site. If you have CC2 you can modify them to suit your needs and if not then a "reader" is available so you can still print them off. Another bold move is to include an A3 size, double sided, fold out map for miniatures ... Excellent!. As for the scenario itself it takes place over the area surronding the village of Brandon's Bridge and as such has a few adventure locations although only the thieves lair actually has a map. I think that more could have been done to fill out the adventure by beefing up the other encounters as the module feels a little on the light side. The plot is basic but good and as it is for 2nd level characters it follows on nicely from the first module. Good Points : Good artwork, good story and well presented. Floor plans included - nice touch.